For personal help with the PrairieCat catalog or your account, please contact your library. PrairieCat is the online, automated catalog for 132 libraries across northern Illinois that places more than 4 million items at your fingertips. Through a statewide delivery system, items can easily be sent from one library to another and borrowed items can be returned directly to your home library. If you chose to search the local library and you get “No catalog results found”, try performing an “Advanced Search” and choose “any” library. Type in your search word(s) (no punctuation or capitalization is necessary), then click the arrow or press the enter key. If you have misspelled a word you will be presented with a "Did you mean" question with the correct spelling in a blue link. Use the Advanced Search to combine a keyword, title, author or subject. Further narrow your search by choosing a specific format, library, language, and/or publication year. A search that results in a single hit will display the full bibliographic information for the title as well as the holdings. 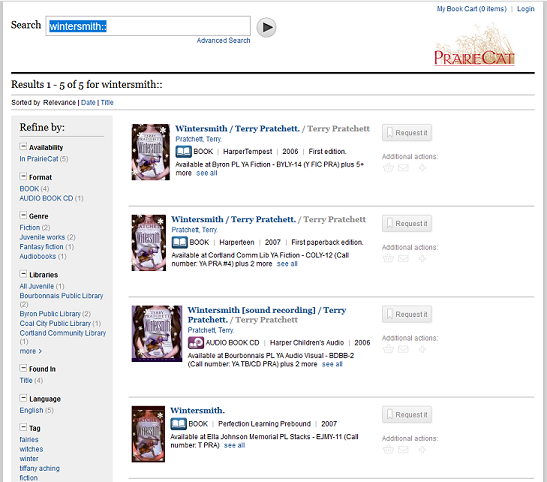 A search that results in multiple hits will display brief bibliographic information. 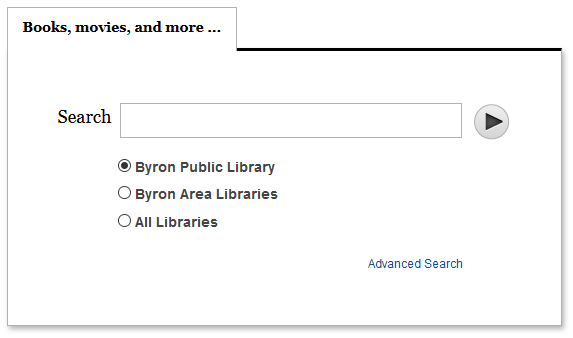 You may click on the + sign next to items to display the libraries that own the title and the shelf status. Click on the title to display the full bibliographic information. Note: In the brief display an icon appears to the left of the title indicating format (book, audio book CD, DVD, etc). Format - select the format you are interested in such as book, audio book on CD, large print, DVD, etc. Publish Date - choose the year the item was published. Setting - refine your results based on the geo- graphic area the title covers. The My Account feature allows you a real time look at the items you currently have checked out, on hold, can renew, etc. In order to access My Account you must first Login using your patron barcode and PIN number. Messages - will display a message from the library if there is one in your account, such as you need to update your contact information. Checkouts - allows you to view the items currently checked out and their due dates. Fines/Fees - allows you to view any money owed and make an online payment if desired. Reading History - if you opt in, Encore will retain information on the titles you have checked out and returned. You may sort this list by title and author. ILL - consult your library to determine if they use this feature to request an interlibrary loan. Edit Account - allows you to add an Alternate ID, change your email or phone number, and opt into text alerts for notifications (message & data charges may apply. My Lists - allows you to view and manage lists you store in your account. Lists can be materials you want to read in the future, or materials you have used for a research project, etc. If your library does not own a title, you have the ability to place a hold on the title and receive it from another library. Click on the “Request It” link. The pickup location will automatically default to your library; however, you may choose a different pickup location. Submit your request. You will receive a message that indicates that you will be contacted when your item is ready for pickup. You may cancel your hold at any time. Simply click on the box next to the title and choose “Update List” or cancel all holds by using the “Cancel All” button. If you receive an error message, please check with your library staff. Items may be renewed as long as your account is in good standing, there are no holds on the material, or you have not already exceeded the renewal limit. Check with library staff for specific renewal periods. For additional help with the PrairieCat catalog or your account, please contact your library.